Exposed aggregate concrete refers to the various types of aggregates (materials) that appear in the concreting mix to create unique looks and styles and perfect for any interior or exterior project. 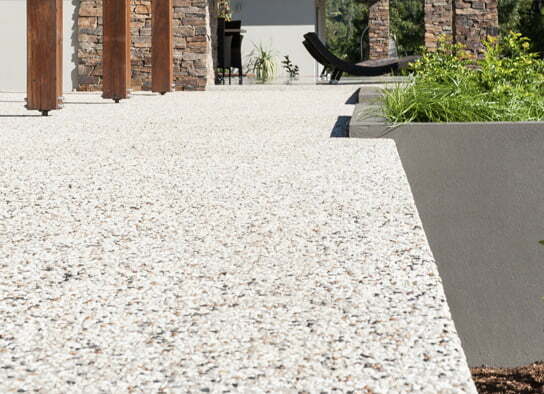 Exposed aggregates appear in both polished concreting adding texture and style to the polished look, and outdoor concreting perfect for an attractive slip resistant texture ideal for pool surrounds, paths and driveways. Aggregates are various types of crushed rocks, that when mixed with cement, produces many great looks and styles. The term is also used for the smaller particles that are commonly called sand. They are still crushed or worn down rock. The average concrete that is used in house construction has very specific aggregate mixes, it will have a certain percentage of rocks that just pass through a certain size sieve. 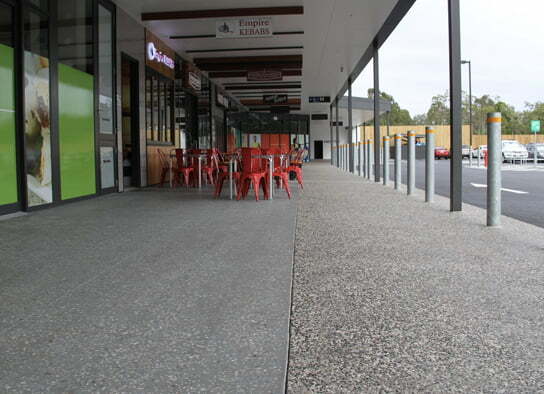 McGinn Concrete exposed aggregate finishes are well priced, and have an unmatched range of amazing styles and colours that will match or enhance any area around your residence or commercial property. 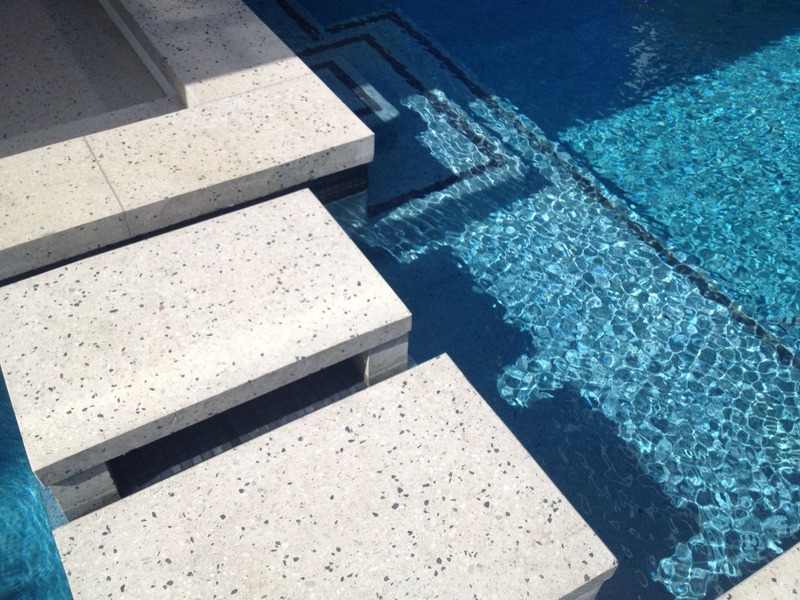 Take a look at our outdoor concreting solutions. There are various ways of producing an exposed aggregate concrete finish including; water washing, abrasive blasting, acid etching & stencil blasting. McGinn Concrete suggests that the most common technique for producing exposed aggregate concrete finishes is via the “water wash off technique”. This technique removes the cement matrix at the surface of the concrete slab using brushing & flushing of the surface with water soon after the poured concrete has stiffened. All you have to do to clean and enhance the appearance of McGinn Concrete exposed aggregate is to use an acid wash and concrete sealer to protect the exposed aggregate concrete from stains. It’s that easy! You can also choose a number of aggregate types to complete your customised look. McGinn Concrete partner with Boral so to view Borals range of aggregates, visit their product range here. Concrete is usually described by it’s strength and then by the size of the largest aggregate used. building the maximum aggregate size is 20mm. We use 10m concrete mixes for more specific jobs like block-work core fill or paving slabs. The aggregates can vary in size, they can vary in texture from smooth river worn pebbles that are ideal for barefoot traffic around pool areas to the sharp crushed rocks for driveways. The material itself may also vary, especially with seeded surfaces. For example, crushed glass is not uncommon. To create an even more unique look, you can add the aggregates to white cement rather than the standard grey and can also add liquid dyes or powdered ochres to the mix to create more contrasts in the concrete. The team is happy to show you some different options and recommend some looks for your project so call today.